It was a busy week for AC360 but they did manage to squeeze in a few extras before leaving for London. John Nowak (C) 2011 CABLE NEWS NETWORK. A TIME WARNER COMPANY. ALL RIGHTS RESERVED. John Nowak (C) 2011 CABLE NEWS NETWORK. A TIME WARNER COMPANY. ALL RIGHTS RESERVED. 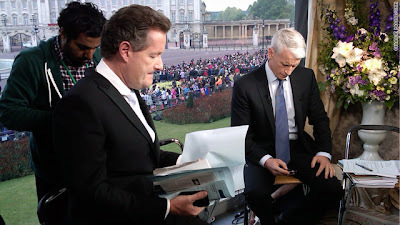 Piers Morgan, Cat Deeley and Anderson Cooper broadcast live in front of Buckingham Palace. Welcome to the Royal Wedding. We'll be posting clips and caps of CNN's wedding coverage throughout the day today. Piers Morgan, Cat Deeley and Anderson Cooper broadcast live in front of Buckingham Palace on Friday, April 29th, 2011 in London, U.K.
Anderson Cooper opened AC360 from London but threw to John King to cover the Breaking News of the destruction in six Southern states from the tornadoes that struck Wednesday evening. The first half of 360 concentrated on the storm coverage and the second half on the countdown to the Royal Wedding in London. Stephen placed Anderson on his Absurd-U-Chart and challenged Anderson to a cable news ratings feud! Anderson talks about hoping to return to Haiti to interview the new president; among other things Haiti. Sharon with Anderson and Kevin Frazier at the taping of the Insider. 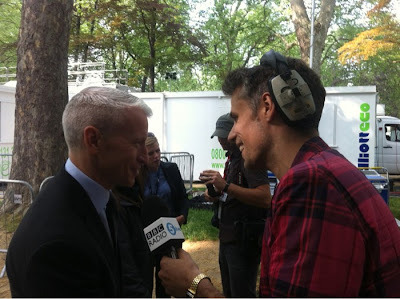 Anderson Cooper is usually known for reporting from the latest war zone or disaster. But for the past few weeks, he has been busy trying to figure out who the Earl of Wessex is, researching hat makers and treating wedding dresses with forensic scrutiny. 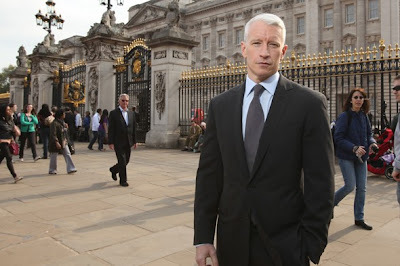 Yes, it's royal wedding time, and Cooper has been sent by CNN to London to cover the union of Prince William and Kate Middleton. He is one of a small army of anchors, reporters, fashion mavens, resident Brits and technical staff to descend on the British capital to deliver wall-to-wall, moment-by-moment documentation of the event. "I was here covering the funeral [of Princess Diana]," he told The Huffington Post on Thursday. "It's nice to be here for a much happier event." Some, of course, might see the explosion of coverage as a bit much. But Cooper defended the amount of coverage the media is devoting to the wedding. "We're a global news-gathering organization," he said. "This is something of great interest to people." He acknowledged that the "fairy-tale mystery" that used to envelope the royal family had been ruptured by the Charles-and-Diana years, but said that he could feel a "huge amount of excitement" in the English air. While he couldn't quite gauge the amount of interest the wedding is getting in the States, he said he thought Americans were naturally curious about the monarchy. "There's this fascination that people have with the whole idea of a royal family," he said. "It is this odd, anachronistic system and yet it has great relevance." 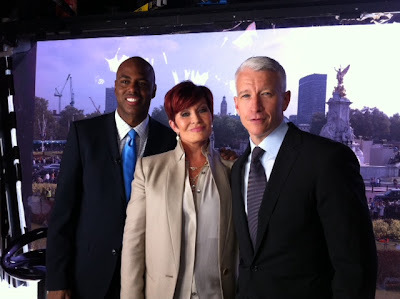 Cooper is co-hosting CNN's coverage with, among others, lifelong British person Piers Morgan. Has his colleague's famous cockiness reached new heights now that he is on his home turf? "I actually haven't seen him," Cooper said. "I don't know where he is!... He certainly knows this story backwards and forwards." He is not, however, without more helpful U.K. natives. He said he was turning to them to get a hang of royal etiquette -- he still doesn't quite understand how you are supposed to pronounce "ma'am" when you meet the Queen a second time -- and of British slang. "I just learned 'cheeky monkey,' which is my favorite so far," he said. And what of the wedding itself? Cooper said he is looking forward to the "pomp and ceremony" of the event, but that, in general, he is "not a big fan of weddings." "This is something I would enjoy far more than a regular wedding," he said. And why is that? "I think I get stressed out at weddings," he said. "They're always such a big event, and I always feel like the bride and groom are so stressed." He said that the weddings he's been to and enjoyed tend be smaller and more intimate. And could he ever see himself tying the knot? "Sure, I guess," he said. "Who knows?"